Deep Hole Vac-u-Gun – Blow Chips Loose and Vacuum Them Away in One Step! Last week, we looked at the Vac-u-Gun, and you can take a look at that blog here. This week I wanted to present the Deep Hole Vac-u-Gun, a special iteration of the Vac-u-Gun, designed to provide a solution to the troublesome process of cleaning cavities and drilled holes. The Deep Hole Vac-u-Gun is a low cost solution to quickly remove chips and debris from grooves and drilled holes where blow gun could create potentially hazardous flying debris. The Deep Hole Vac-u-Gun is simply positioned over the hole, and the trigger squeezed and then a small blow tube delivers a a stream of air to dislodge and lift the chips while the large suction tube vacuum them away. The operator is protected form flying debris since all chips and debris is contained within the clear suction tube. The device is capable of cleaning holes up to 1-1/4″ (32mm) diameter and 18″ (457mm) deep! How does the Deep Hole Vac-u-Gun work? Compressed air, normally 80-100 PSIG (5.5 – 6.9 bar), flows through the inlet (1) into an annular plenum chamber (2) when the trigger is pressed. A small amount of air is injected into the blow tube (3) to provide agitation and lift to the chips or debris. The larger airflow is injected into the the throat of the gun through directed nozzles (4). The jets of air create the vacuum at the intake (5) which draws the material in and accelerates it through the unit. The chips, debris or other particulates can then be exhausted into a filter bag or hose attached to the Deep Hole Vac-u-Gun System. Holes in fixtures, drilled plastics, T-slots’groove cleaning , coolant evacuation from parts, woodworking, tapped holes, cavity evacuation, and many more! Low cost, no moving parts/maintenance free, durable die cast construction, eliminates shock hazard – no electricity, meets OSHA pressure requirements, safe operation – no flying chips, lightweight and portable, and quiet. The Deep Hole Vac-u-Gun uses less compressed air than ordinary blow guns, and the amplified output flow is 12 times the air consumption rate. Note that the Deep Hole Vac-u-Gun should not be operated without a filter bag or vacuum hose attached to the exhaust. The Model 6094 is the Deep Hole Vac-u-Gun only. The Model 6194 comes with a reusable bag and clamp for debris collection. The Model 6394 comes with the reusable bag and a 10′ (3m) section of vacuum hose for transferring the debris to a collection point. If you have questions about the Deep Hole Vac-u-Gun or any of the 16 different EXAIR Intelligent Compressed Air® Product lines, feel free to contact EXAIR and myself or any of our Application Engineers can help you determine the best solution. The air gun is a quintessential tool found in a variety of settings. Machinists will use them to blow chips, debris, and coolant from parts as they’re being finished. They’re commonly used for final cleanup before an item is packaged…nobody wants to open up a brand new product and find dust, dirt, or dried-up coolant spots on it. They can make a quick job of cleaning off a work bench…if you intend to sweep the floor afterwards, that is. In fact, larger air guns can even be used to “sweep” the floor. I recently had the pleasure of assisting a user who was going completely the other way…from the floor, that is. His company had been contracted by the new owners of a rather large show facility to “rehab” the building. Before they could do anything, though, he needed to clean years and years (and years, he said) of dust, sediment, cobwebs, and other various debris, from the open rafters overhead. All 42,000 square feet of overhead. And, because of their schedule for getting the facility ready for upcoming shows, it needed to be done quickly. After discussing the application and comparing the capabilities of our various Safety Air Gun offerings to the available compressed air supply, I recommended, and they purchased, two Model 1360-48 Heavy Duty Safety Air Guns, fitted with Model 1106 High Force Super Air Nozzles. These made short work of a big part of the job, allowing them to move quickly on to the rest of the building restoration. If you’ve got a cleanup job…big or small…perhaps an EXAIR Safety Air Gun is the solution. We’ve got them ranging from the Model 1408SS Precision Safety Air Gun, fitted with our 1108SS Atto Super Air Nozzle (2.5 SCFM; 2.0 ounces of force,) to the Model 1218-6 Super Blast Safety Air Gun, which uses our largest High Force Super Air Nozzle, the 1120 (460 SCFM, 23 pounds of force,) and 29 models in between. We can provide them with accessories such as Chip Shields, Stay Set Hoses, Rigid Pipe Extensions, and Compressed Air Hoses, as needed. Give me a call to find out which one is right for you. Here are just 2 of our 53 distinct models of Safety Air Guns. I bet we’ve got the one you’re looking for. Last week I pointed out the important locations for measuring your compressed air system pressure throughout your compressed air system. One of the critical points to measure system pressure was before and after each filter. This leads into another question that I receive every once in a while, “How do I tell when the filter needs to be changed?” The answer to this is easy, when you see more than a 5 PSIG pressure drop across the filter. This means that the element within the filter has become clogged with sediment or debris and is restricting the volume available to your downstream products. This can lead to decreased performance, downtime, and even the possibility of passing contaminants through the filter to downstream point of use components. In order to maintain an optimal performance when using EXAIR filter separators and oil removal filters, monitoring the compressed air pressure before and after the unit is ideal. Replacement filter elements are readily available from stock, as well as complete rebuild kits for the filter units. Changing the filters out can be done fairly easily and we even offer a video of how to do it. The life expectancy of a filter element on the compressed air is directly related to the quality of air and the frequency of use, meaning it can vary greatly. If you tie a new filter onto the end of a compressed air drop that has not been used in years, you may get a surprise by the filter clogging rather quickly. However, if you maintain your compressor and your piping system properly then the filters should last a long time. Generally we recommend checking your filters every 6 months. If you have questions about where and why to filter your compressed air contact us. Of all the tools that I own, my cordless drill has to be just about my favorite. I’m remodeling a bathroom in my house right now, and last night I was setting the new toilet flange onto the new tile floor. I had to drill some holes for this through the new tile. I’d never done this before, and was definitely feeling some heartburn about it. Especially after finding out just how fragile and brittle ceramic tile is…I cracked two pieces, just trying to cut a hole for the heat & AC vent register. Luckily, that was BEFORE I mortared & grouted it in, so it wasn’t a big deal…they’re about a buck a piece, and I got five extra anyway. I know how to do this but I have no idea how to fix this. THIS one, though, was fully installed, and, despite all the internet videos I found & watched on how to install a tile floor, I haven’t yet had the need to find one that shows me how to replace a broken tile. And I don’t really want to, so I went slowly and carefully with the drill, using the special glass & tile bit that I bought. On my first hole, when I got the bit through the tile itself, I changed to a different (smaller) bit to pilot the screw hole through the subfloor. Then, I put a Phillip’s head bit in to drive the screw. It occurred to me that I was performing these three related but separate tasks, with the same tool…I just thought that was very cool. *One wants to use a Model 150200 2” Heavy Duty Line Vac to convey cement. They’re currently hauling the bags, by hand, up to a hopper, where they cut them open and dump them in. *One needs to move small springs, one at a time, from a hopper to an automated assembly turret machine. The springs are 5/8″ in diameter, and they’ll be fed through a length of PVC pipe. Our Model 151100 1″ NPT Heavy Duty Threaded Line Vac will be easily installed in the pipe line using standard threaded fittings, and the springs will pass through the 0.75″ throat nicely. *One has a auger-type chip conveyor that removes machining debris from a lathe, and it’s broken…again. They needed a Model 6066 3” Stainless Steel Line Vac, in a hurry, to use until they get their chip conveyor fixed. In fact, if it works, they may not fix the chip conveyor. With a wide range of sizes and materials of construction, we’ve got your solution. Call us. So, kind of like my cordless drill, our Line Vac Air Operated Conveyors have a variety of uses, right out of the box. If you have an application that you think a Line Vac may be able to solve, give me a call. By the way, if you order one before the end of October, 2014we’ll give you a FREE 2″ Flat Super Air Nozzle. Really. One of the easiest ways to solve a blow off application is to install an open pipe or tube; it’s generally quick and available. They are easy to make, mainly you just need some pipe, maybe a hacksaw and hammer, and a way to hook them up to your compressed air system. They will provide a good amount of force but at the cost of safety, noise level, and air consumption. That’s right: it will cost you in SAFETY, NOISE EXPOSURE and COMPRESSED AIR CONSUMPTION. I’m going to go out on a limb here (not really) and wager there are a number of folks in any organization unwilling to pay those costs – if you are willing, you may want to reconsider. I have been to many manufacturing facilities where they have used copper line to bend into a tight space and then pump 85 psi into the pipe in order to try and blow a piece of lint out of a roller or to keep trim from getting caught in a pulley system. In some cases I have seen 3/8″ ID pipe to keep dust and lint out of a pulley. This is not needed at all. The estimated flow through a 3/8″ ID tube that is around 3′ long would be roughly 109 SCFM when powered at 85 psig. All to keep dust off and loose fiber out of a certain area. The reason they plumbed this large of a piece of tubing into the area was simple, it’s what they had and it worked great (words from the maintenance worker). For additional reference, our 91 SCFM air nozzle produces 4.5 pounds of force which seems a bit of overkill when you can blow dust away with your breath. In one instance I looked over the material and scrap they were trying to keep from getting to the outer workings of the machine I made the recommendation for them to utilize a model 1100SSW, – a 1/4 NPT Stainless Steel Super Air Nozzle w/ Swivel Fitting. This would give them flexibility to target the right area through the swivel and require them to change the existing tubing out to a schedule 40 threaded pipe, or use a compression style fitting. 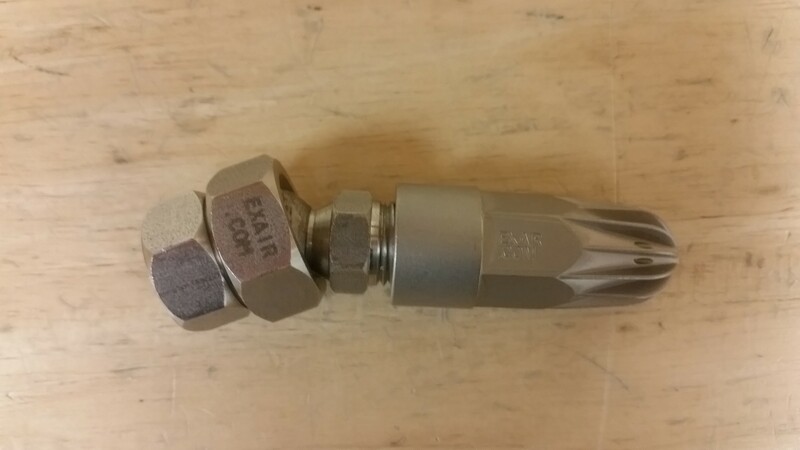 By replacing the single nozzle, the customer was able to reduce compressed air consumption in just this single blow off point from 109 SCFM at 85 psig to 14 SCFM at 80 psig inlet pressure. This single replacement equates to saving 95 SCFM, or $11.40 per 8 hour shift that the blowoff is operated. If the customer operated this blowoff 24 hours a day it would take a mere 4 days to pay the unit back in air savings. The above savings do not include the benefit of being able to reduce the overall operating pressure of the compressed air system feeding this application to 80 psig, instead of 85 psig. In case you weren’t aware, if you lower the pressure value where your compressor shuts off, say from 85 psig to 80 psig, it will save an estimated 2.5% of drive energy for their air compressor. Depending on the type and size of the compressor this could amount to a substantial savings. This system pressure reduction will also lower the operating pressure of any leaks that may be within the system which will also be another amount of savings. All of this is from simply replacing open pipe with an engineered nozzle. This was just one area where the quick and easy way turned out to be the costly and dangerous path. The best part about our engineered solution is they are all in stock, ready to ship same day. This means you can find the problem today, have a solution waiting to be installed tomorrow.